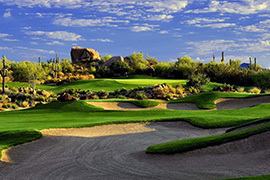 Named after the first of Troon North’s two championship courses, this forty-six-lot subdivision is nest among three of The Monument’s most memorable holes and overlooks its namesake granite spire. Many of these custom homesites feature magnificent views of adjacent fairways and greens, dramatic boulder outcroppings, and nearby Pinnacle Peak. Amply sized and affordably priced, these custom lots are strategically located along secluded cul-de-sac streets and afford the privacy and security of a gated entry.